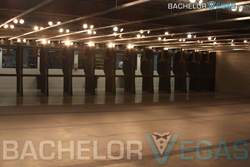 Shooting Las Vegas: Want to do something away from the normal? 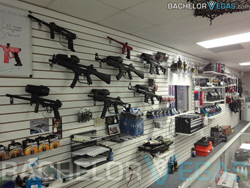 Come and shoot a submachine gun and any two machine guns at the best gun store in Las Vegas called American Shooters. Located just a few minutes off the strip this activity will be sure to get your and your friends adrenaline rushing! Bachelor Vegas will pick you up in style in one of our super stretch limos and whisk you away to an adventure of a lifetime! Once you arrive to American Shooters location you will be put through a short safety course and given earplugs and protective eyewear to ensure everyone's safety. After the brief safety course, you will have access to your own private shooting lanes based upon the number of people in your group. Your group will have the choices of any sub machine gun with 2 magazines (or 50 bullets) then you will also have the choice of any two machine guns with 2 magazines (50 bullets) to choose from as well. You can slam off 100 bullets with the coolest guns on the wall of over 50 to choose from! 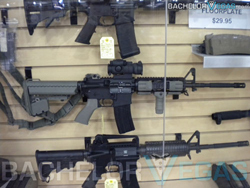 If you decide you want to shoot more bullets, they are available for purchase at a reduced price at the counter. You can test your sniper skills and have a shooting contest with your friends all at American Shooters. Everyone also get a free American Shooters T-shirt as well. Once everyone has had their share of shooting targets, we will have another one of our plush limos to get you back to your hotel safely. Going shooting with your best friends is sure to make Vegas memories that you won't soon forget. This activity usually takes about 2 hours from door to door to complete. It's the perfect activity to accomplish during an afternoon that does not involve any drinking or partying. Save that for the nightclubs with Bachelor Vegas when you are done!